Ashgabat’s construction boom benefits a very select few. On September 7, President Gurbanguly Berdimuhamedov attended the opening ceremony for the sprawling Congress Center in Avaza, the country’s so-called “tourist zone.” Construction by the Turkish company Polimeks began in November 2012 and the zone includes facilities for hosting high-profile events. The opulent new hotels, “Merdan” (Valiant), “Bagtyyar” (Happy), “Shamekan” (King’s Land), and “Khazar” (Caspian) were completed recently. With such rampant profligacy continuing unabated, and contrasting with the demolition of Turkmen homes, it’s clear that the construction industry is a key mechanism of regime stability. The German sociologist Max Weber coined the rather orientalist term “Sultanism” to denote regimes which are extremely patrimonial by nature. The regime is held in place not by ideological unity, but by a mixture of fear and rewards, with the bureaucratic relations of the state entirely subject to the arbitrary whims of the elite. Under such a system, private interests prevail over any notion of the public good. Furthermore, the ruler and his collaborators freely appropriate public funds, establish profit-oriented monopolies, and demand tribute from businesses. In the case of Turkmenistan, the lion’s share of the country’s hydrocarbon revenues go to the Foreign Exchange Reserve Fund (FERF) and are completely shut off from public scrutiny. Global Witness estimated the funds to be worth $2.6 billion in 2004, but the estimates for 2009 had risen to over $20 billion. Far from being a benign initiative to retain economic stability in a time of crisis, these funds predominantly act as patronage for Turkmenistan’s elite. Under former President Saparmurat Niyazov, for example, a German bank account attributed to him was said to hold $3 billion under the guise of the FERF. In stark contrast, the port city of Turkmenbashi has rampant homelessness, with many sleeping under the warmth of city’s eternal flame commemorating World War II. After Russia, Turkmenistan has the position of second most unequal country in the former Soviet bloc, with a leaked government census from 2012 revealing that just 4 percent of the country’s population control 45 percent of its wealth. In 2014, Transparency International’s Corruption Perception Index ranked Turkmenistan 169 out of the 174 countries measured that year. A key means of transferring patronage among the elites is the use of construction projects. According to a Wikileaks cable, the price that foreign contractors pay to meet with the president has risen by “10 to 15 percent” since Berdimuhamedov came to power, while the price of construction contracts has inflated by up to 30 percent to accommodate the payment of bribes for top government officials. According to the same cable, Polimeks, and the French construction firm Bouygues, do not pay any taxes, and instead “work something out” with officials. In addition, many Turkmen businessmen allegedly register their construction companies offshore, allowing money to be sent outside the country. Berdimuhamedov relies on a small international business clique inherited from his predecessor. Under Niyazov, a few people of non-Turkmen origin were granted a considerable amount of power, often acting as his advisors. This group included, among others, Yoseph Chalyk, the long-time Vice-Minister of Turkmenistan’s Textile Industry and owner of the construction company Chalyk Holdings. Other major companies include the previously mentioned Polimeks (owned by Erol Tabanca), and the French construction company Bouygues. According to the memoirs of Aldo Carbonaro (director-general of Bouygues’ Turkmen subsidiary from 1999 to 2009), Niyazov had requested that the company organize his funeral. Carbonaro also alleged that the company’s CEO, Martin Bouygues, was frequently treated like a head of state. Other construction firms, such as Turkey’s Chalyk Holding, also had close relations with the former president; the company’s chairman, Ahmet Chalyk was treated “like a son” and given Turkmen citizenship. These same networks are still thriving, with Chalyk starting the Avaza project with a $1.5 billion renovation in 2013. Bouygues has also remained prominent, constructing Berdimuhamedov’s monolithic, $250 million presidential palace. The company earned over $2 billion between 1994 and 2010, constructing over 50 buildings and giving Ashgabat its signature marble façade. Turkish companies dominate the market however, with “about 600” companies registered in the country in 2014 and over $32 billion in construction investments since Turkmenistan gained independence. Polimeks has the two largest projects in the country: the new Ashgabat airport, worth over $2 billion, and the sports complex for the 2017 Asian Games, estimated to be worth as much as $3.5 billion. It was noted in a Eurasianet piece earlier this year that the success of firms such as Chalyk and Polimek “creates a powerful incentive” for others to follow. However, for those who lack the intimate networks, Turkmenistan’s sultanistic market can be a dangerous investment prospect. Reportedly, every foreign business representative that comes to Ashgabat seeking a deal has to pay homage to Avaza by offering to invest in its infrastructure. Many Turkish investors hoping to make it big have found themselves facing the full brunt of an unpredictable investment market. Muhammet Cap, the head of the construction firm Sehil Insaat, is fighting the Turkmen government for $300 million at the International Center for Settlement of Investment Disputes in Washington, DC. According to Eurasianet, he was forced “to leave behind assets and equipment of a local subsidiary” seized by Turkmen authorities. Twenty other companies have filed lawsuits against Ashgabat. The 1992 Turkmen-Turkish investment treaty obliges Ankara’s companies to pursue settlements via Turkmenistan’s court system. According to RFE/RL, in 2013 businessman Faruk Bozbey said that most of the aggrieved foreign businessmen are terrified to set foot in the country. He elaborates further: “They [Turkmen authorities] tell us to come to discuss [this] in Ashgabat. No one goes there. [The firms] are afraid a [criminal] case may be opened against them.” According to the Turkmen Initiative for Human Rights, many Turkish firms in Avaza refused to finish projects due to the Turkmen authorities extracting tribute, leading to local workers being encouraged to “volunteer” to complete the projects. Rather than rely on companies outside his inner circle, Berdimuhamedov appears to be centralizing new contracts among his personal networks. 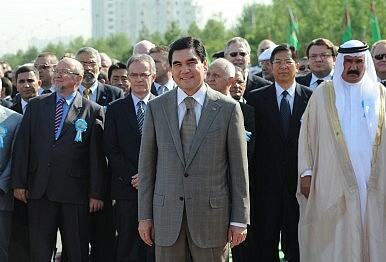 The Union of Industrialists and Entrepreneurs of Turkmenistan, run by Aleksander Dadaev, a long-time ally of Berdimuhamedov, was entrusted in 2014 with a $500 million project in Ashgabat’s “13th neighborhood.” The company has been expanding into the construction sector recently, gaining ground in what was once the privileged preserve of Turkish businesses. As austerity and demolition continue to be prescribed to the masses, corruption, looting, and profligacy will continue to be the order of the day for the privileged few.